Fig. 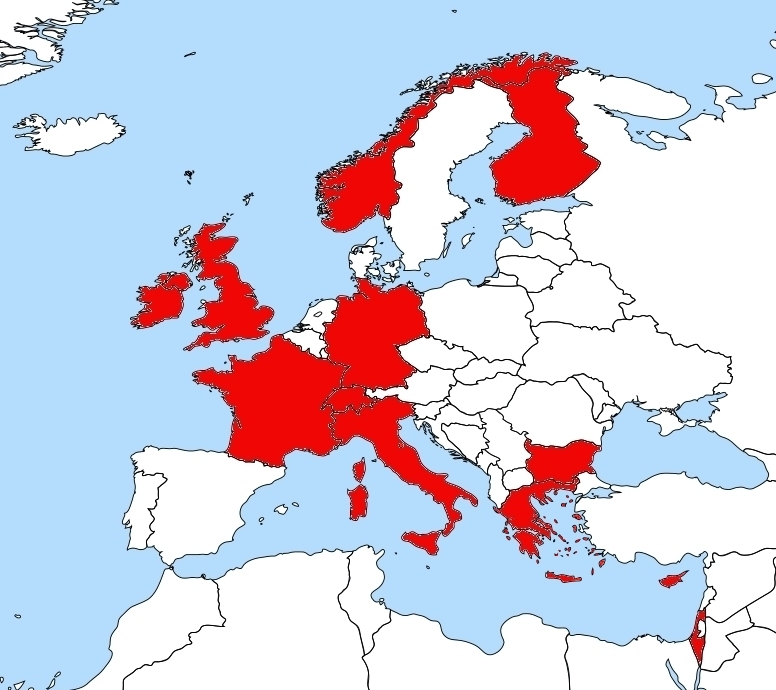 1: Nations involved in BACCHUS. There are 20 participating institutions from 11 European countries and Israel. Sweden joined as an associate partner. 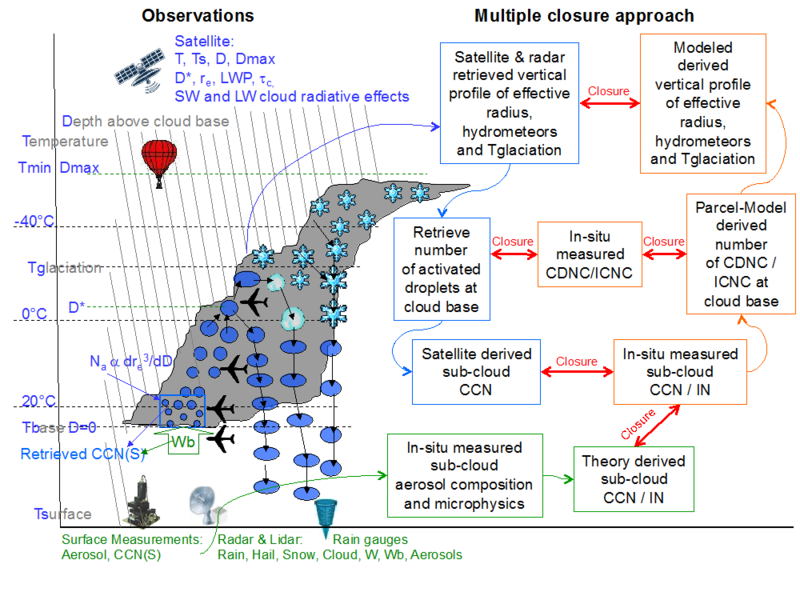 Clouds are a very important, yet not well understood feedback factor in climate change and they contribute to the effective radiative forcing (ERF) from aerosol-cloud interactions (ACI). The uncertainty in ERF related to ACI is larger than for any other forcing agent. Also, feedbacks between the terrestrial and marine biosphere and the atmosphere involving ACI are thought to play an important role in regulating climate change but their relevance remains poorly quantified. BACCHUS is a collaborative effort of many European institutions. The participating countries are depicted in Figure 1. It proposes to quantify key processes and feedbacks controlling ACI, by combining advanced measurements of cloud and aerosol properties with state-of-the-art numerical modelling (Fig. 2). The analysis of contrasting environments will be the guiding strategy for BACCHUS. We will investigate the importance of biogenic versus anthropogenic emissions for ACI in regions that are key regulators of Earth's climate (Amazonian rain forest) or are regarded as tipping elements in the climate system (Arctic). TROPOS will provide new measurements of aerosol and cloud properties with the LACROS platform at Leipzig. Also data of own past measurements in the EARLINET, CloudNET and AERONET networks will be processed for BACCHUS. Fig. 2: Scheme of measurements and envisaged closure studies in BACCHUS. BACCHUS will generate a unique database linking long-term observations and field campaign data of aerosol, cloud condensation and ice nuclei and cloud microphysical properties; this will enable a better quantification of the natural aerosol concentrations and the anthropogenic aerosol effect. BACCHUS will advance the understanding of biosphere aerosol-cloud-climate feedbacks that occur via emission and transformation of biogenic volatile organic compounds, primary biological aerosols, secondary organic aerosols and dust. Integration of new fundamental understanding gained in BACCHUS in Earth Systems Models allows to reduce the uncertainty in future climate projections. This will have a direct impact on decision-making addressing climate change adaptation and mitigation. BACCHUS brings together a critical mass of experimentalists and modellers with the required scientific expertise to address these complex topics and a high commitment to communicate their findings in many ways in order to ensure a high-impact project.